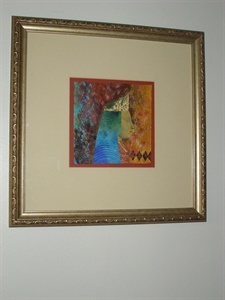 My wall art includes collage, watercolor, acrylic painting, and assemblage. It is truly Mixed Media. 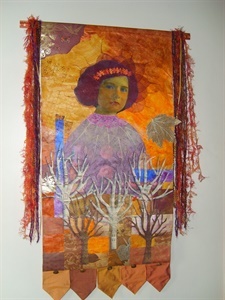 The trees are collaged using painted book pages. The image is autobiographical. The trike was mine at 3, now I am on an artistic path and I don't know where it will lead. 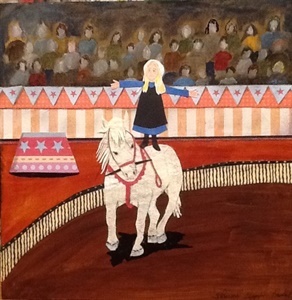 This work is included in Incite 3: The Art of Storytelling, published September 2015. 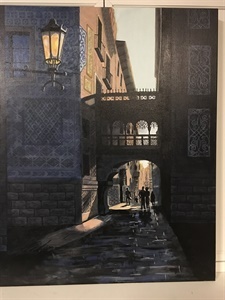 Acrylic painting from a photo that I took in Barcelona, Spain. 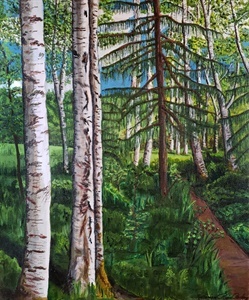 This piece has been selected to be published in AcrylicWorks 6: Creative Energy in May 2019. 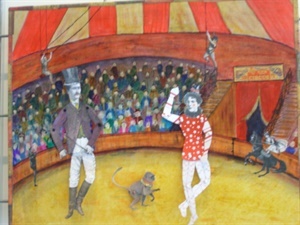 It has also been accepted in the Illinois State Fair (2018). 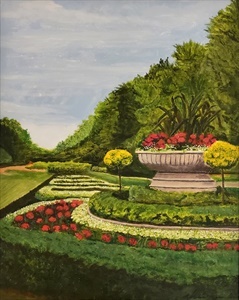 This painting was made after a visit to the beautiful Japanese Gardens in Portland. 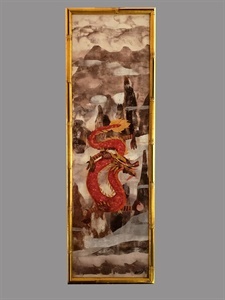 This piece is collaged with hand-painted papers. 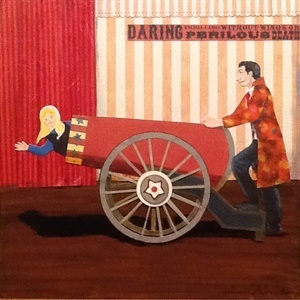 It is painted on 5 canvases and framed with different old architectural elements, including a rusty can and wheel. This is an October day in Southern Illinois. The lake is slightly south of Ferne Cliff Park near Goreville, Illinois. This is watercolor. 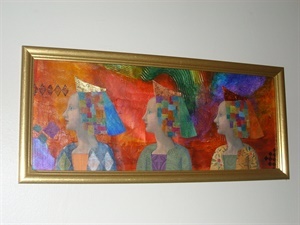 This collage was created from book pages which I hand painted. You can read the words on the leaves, trees, wall, and man. 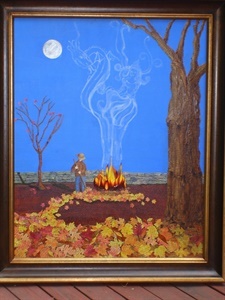 The images in the smoke are from the burning leaves. 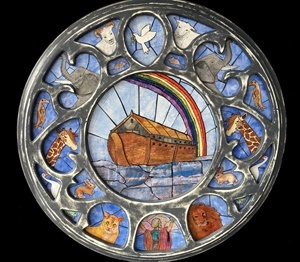 This has a painted background with jointed movable images which can taken off the canvas and replaced with a different person or animal. See extra pieces. The edge is collaged with vintage tickets. 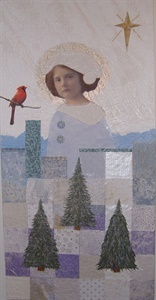 Mixed media painting with collage elements. 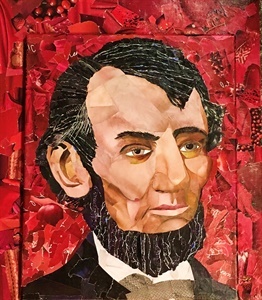 The drops of paint are collaged with torn papers. Each has a paintbrush with a handle of the color. The clock face says "Time to Paint" but there are no hands since it is always time to paint. 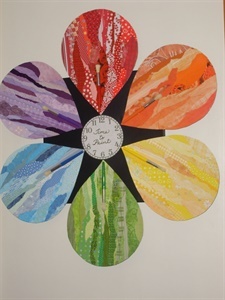 This is one of a set of 4 collages--the others are Spring Serenade, Summer Melody, and Autumn Song. Acrylic painting of the cathedral of Orvieto, Italy, as seen through the streets. Mixed media from a photo that I took in Alaska. The leaf from the vine was inside the turned back birch bark like a hidden gift. This is based on a true story which comes from the 1964 Alaskan earthquake. 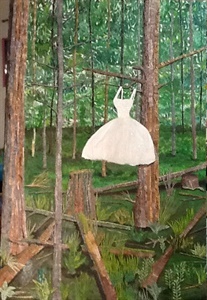 It is about a prom dress that got swept away by the tsunami wave which hit Seward. It you want the complete story, e-mail me. This is mixed media and is textured. The dress is real fabric. Claudia has to mentally remove herself from her body during a mammogram. 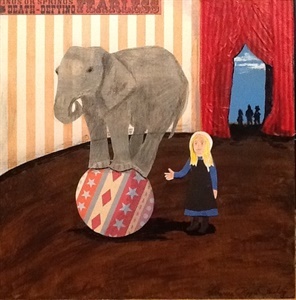 An Amish girl becomes a circus star. 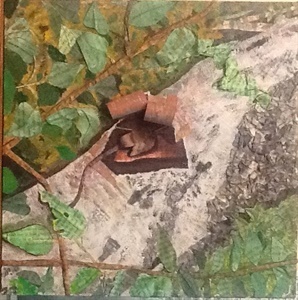 Collage on birch panel. Collage entirely created with magazine advertisements. Won 3rd place in the Illinois Times Visitors Guide Cover contest 2017. 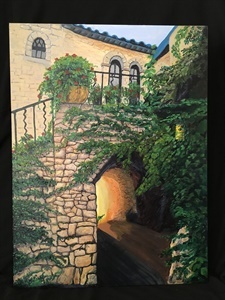 Acrylic painting from a photo that I took at the medieval castle fortress at Eze, France. 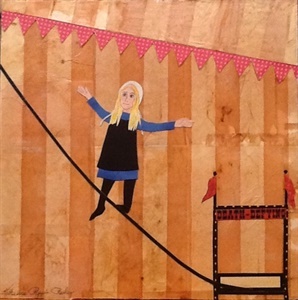 From A (artist) to Z (zany) the woman's alphabet covers women's lives. 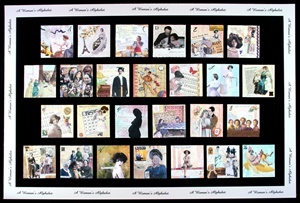 These 4" x 4" images have been turned into cards which may be purchased singly or as a set of 26. Collage made with hand painted papers. 1863 was the year of several key battles of the Civil War as well as the Emancipation Proclamation. 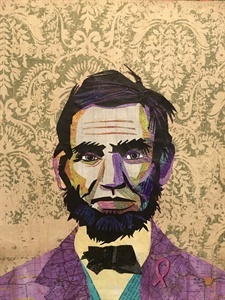 My Lincoln shows determination and strength, qualities that he needed to accomplish the great task of saving the Union. 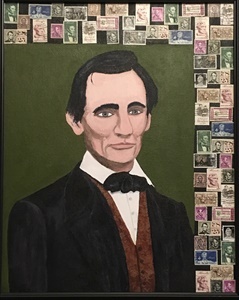 Acrylic painting of the young Lincoln with a college of Lincoln stamps around two sides, appropriate since Lincoln was a postmaster in New Salem. 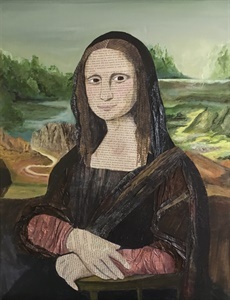 Painted background with collaged body, Mona's face and hands are book pages. The clothing is hand painted gelli plate paper. 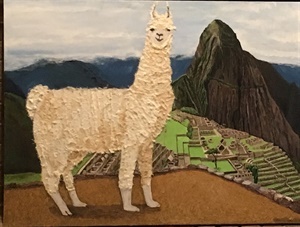 The llama is on an overlook at Machu Picchu. 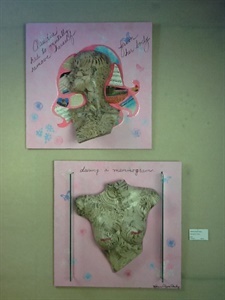 The body is collaged with handmade paper. The foreground is textured. Machu Picchu and the mountain are done with acrylic paint. I saw the bubble blower and his wonderful bubbles by the Tate, but wanted an iconic London image. So I painted Tower Bridge and added the bubbles over it. My daughter got up at 5:30 a.m. to run in Regents Park. One morning I went with her and took pictures. 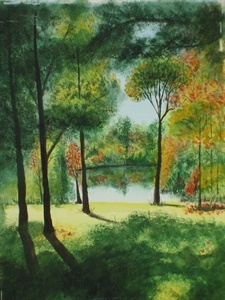 This is one of the views that I painted. 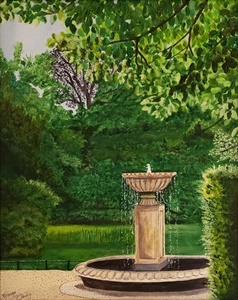 This was another beautiful scene in Regents Park in early June. The sun was just coming up and the light was wonderful. This was a lovely view at the Anchorage, Alaska Botanical Garden. 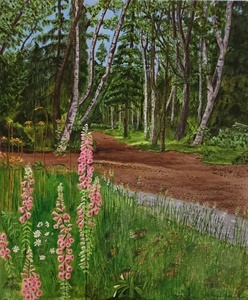 I painted this acrylic from another photo that I took at the Botanical Garden in Anchorage. Alaska. 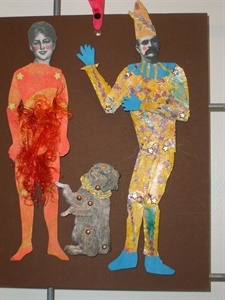 This is a collage created entirely from my painted gelli papers. Each scale is separate. 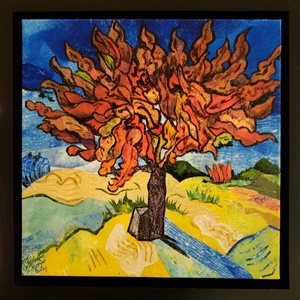 This is my collaged version of Van Gogh’s mulberry tree. 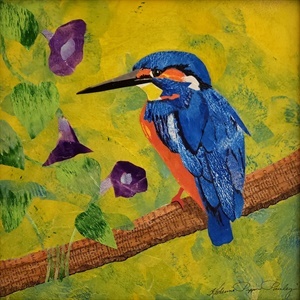 It was created using my gelli plate papers. 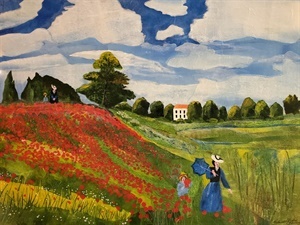 I have always loved this Monet painting and decided to try and copy it as a collage. My papers are all painted using the gelli plate. 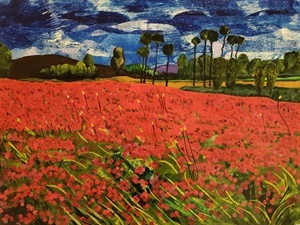 I tried to recreate Van Gogh’s poppy field in collage using my gelli paint papers. 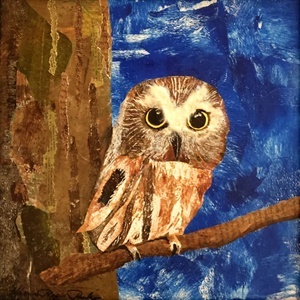 The owl is a collage created with gelli paper, painted book pages and handmade paper. 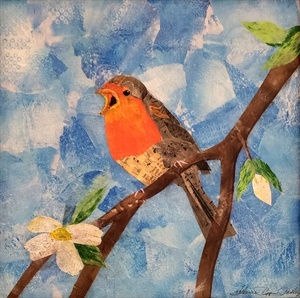 The robin is sitting on a dogwood branch singing his song. 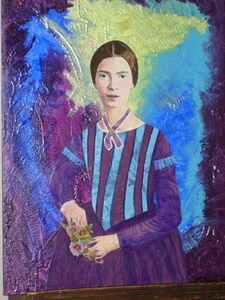 This collage is created with gelli papers, painted book and music pages.